St John the Evangelist is on the south-east side of the junction between Chingford Road and Brookscroft Road in the northern edge of Walthamstow beyond Forest Road. Apart from an early chapel at Higham (which was founded in 1441, gave its name to nearby Chapel End, and was in ruins by 1650), St Mary's parish church was the only Anglican place of worship until 1829. In that year a chapel of ease, St John's, was built at Chapel End on the initiative of the vicar. In 1844 St John's gained its own parish. In 1923 the original church, which had for some years been structurally weak, was demolished. A new one on the same site, designed in a Gothic style by H P Burke Downing and built in brown brick with stone dressings, was consecrated in 1924. Because of lack of funds only three bays of the nave were built at that time. A fourth bay and a permanent west wall were added in 1961. Mathews Memorial Methodist Church is on Penrhyn Crescent, which exits onto Chingford Road just a few metres north of St John's. It originated as a men's meeting connected with the Spruce Hill Congregational mission. 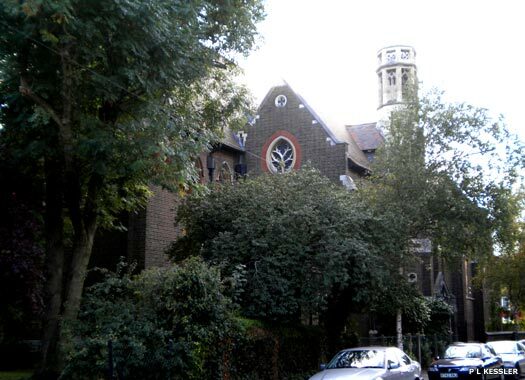 In 1908 the old iron church from Shern Hall was erected in Brettenham Road. It became known as the Men's Own Brotherhood Hall, Chapel End. In 1924 it gained its current name after its most prominent minister. This permanent church was opened in 1930. Spruce Hill Baptist Church is on Brookscroft Road in the slightly burnished Church End area of northern Walthamstow, opposite the entrance to Northbank Road. The church originated in about 1904, when J S Rideout, caretaker of Livingstone College, at the suggestion of R H Eastty, minister at Erskine Road Spurgeon Memorial Church, started Baptist services in a disused shop at the junction of Thorpe Road and St John's Road. In 1905 an iron church was erected as as Spruce Hill Baptist Church in Brookscroft Road. The present church was opened in 1911. The original fittings, including the pulpit, are said to have come from the Erskine Road church which closed in the same year, but this was replaced in 1937 when the interior underwent substantial rebuilding, with a pulpit and gallery over 200 years old being added from a North London church. Membership was 71 in 1939, and 37 in 1967. Spruce Hill Congregational Church used to stand at the eastern end of Brookscroft Road. It originated in 1893 as an independent Trinity Church mission. A small church was built in 1900 but membership was always small. The church was temporarily closed in 1942-1943, and it closed permanently in about 1946. It was sold about 1952 and demolished. 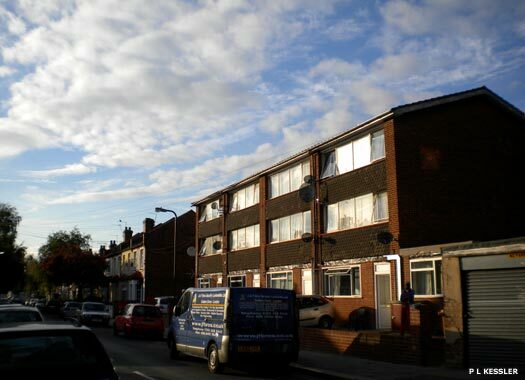 In 1969 the site was occupied by shops, which were demolished or converted into houses (on the right) by 2008. 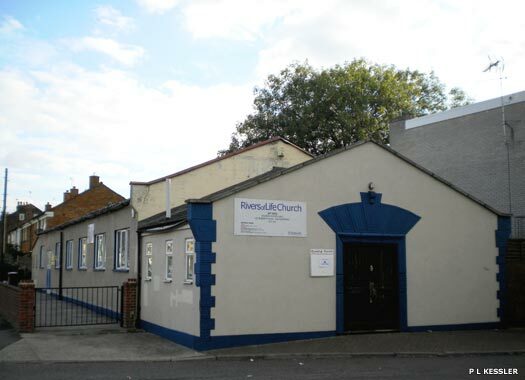 The Rivers of Life Church is housed within Wadham Gospel Hall on Roberts Road in Church End. Probably a fairly quiet area, which is now overshadowed by the roar of traffic from the multiple lanes of the North Circular road opposite. 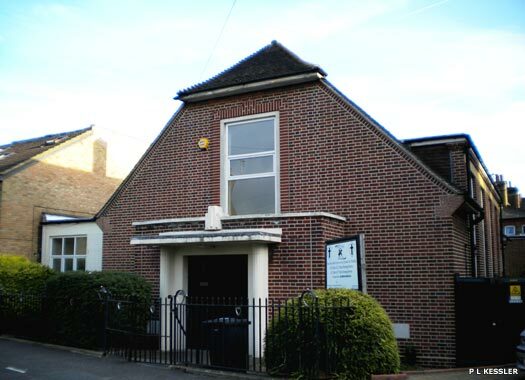 As with many small non-conformist churches in the early twenty-first century, this one shares its premises with a pre-school nursery. The Elim Church here closed down before 2006, and the new church was started by the Kensington Temple. 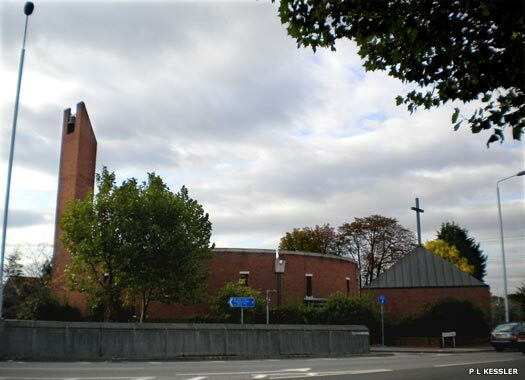 The Catholic Church of Christ the King, South Chingford & Walthamstow, lies on Chingford Road on the northern side of the North Circular. The church was opened in 1932, with only Our Lady and St George predating it in the district. 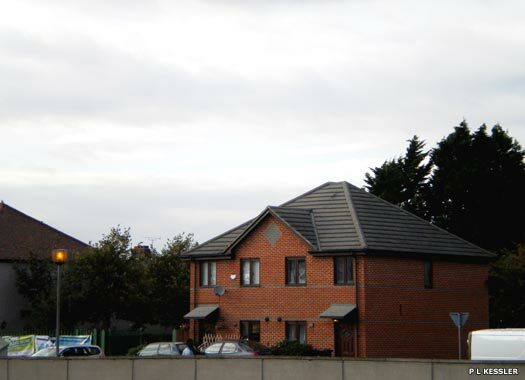 The site immediately south of the church, now a large roundabout over the new North Circular, was the site of the Crooked Billet public house. When that was demolished for the road rebuilding, the church had to be moved back 200 feet. 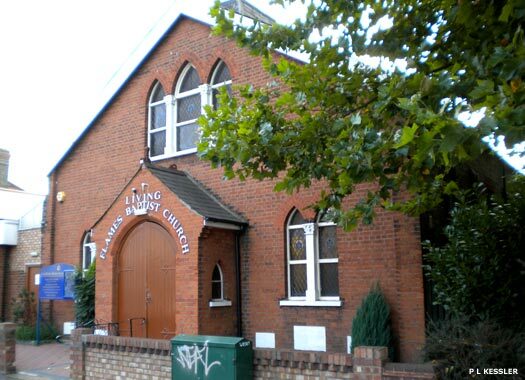 Living Flames Baptist Church is on Fulbourne Road in Church End, again very close to the North Circular but further to the east. 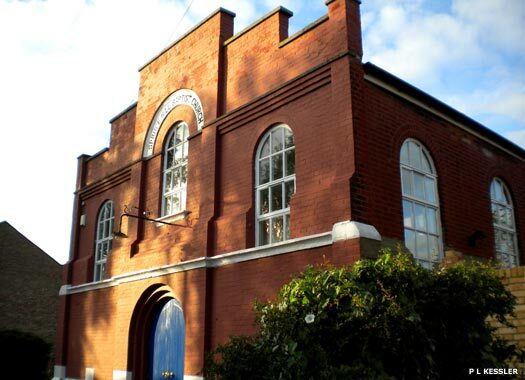 The building began its life as Highams Park Tabernacle, Fulbourne Road, and this church was initially founded in 1904 by T A Tucker as a mission in Station Parade. It moved to Hale End Road in 1905 and Cavendish Road in 1906. 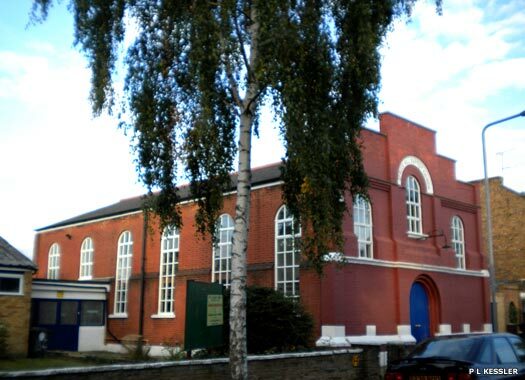 When the present church in Fulbourne Road was built in 1910 the pastor was T H Squire. 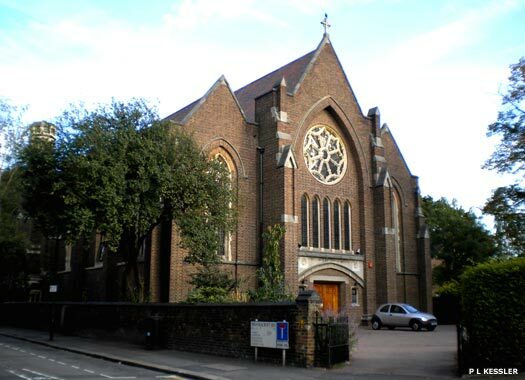 Wadham Road Primitive Methodist Church lay directly opposite Highams Park Tabernacle. The North Circular now divides the two sites. It originated in 1878 as a mission for Marsh Street. Services were held in the open and in a disused skittle alley until a mission hall and site were donated in 1880. In 1903 it was the smallest of the Primitive Methodist churches. A new hall was built in 1923, but closed in 1937 and was later used by the Brethren until its demolition in 1953.